We are Piotr and Goska Antonczak and together we run two dental practices in Devon. The difficulties we found in establishing these surgeries gave rise to our vision for GoTrade. 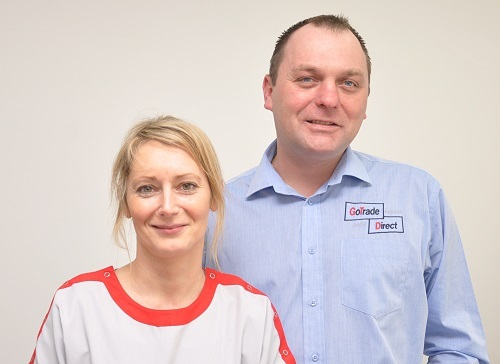 When we moved to the UK several years ago, Goska with substantial experience in dentistry and Piotr having had a very successful career in engineering, we decided to set up our own dental practice. We needed to become established as quickly as possible to achieve income generation so we took over an existing practice which needed extensive modernisation and refurbishment. Initially we thought it could not be that difficult to source our equipment and design our surgeries...but we were wrong. What we found was a minefield of difficulties and frustrations... We found that the prices of equipment were not only exorbitant but delivery was easily delayed. In these times of global production we found most manufacturers outsource the manufacturing of components to other factories located in other countries. A logistical nightmare of delays and missing components can ensue. We felt this also had serious consequences for quality assurance and timing. We found that equipment was supplied without any consideration of the compatibility with existing systems such as electrics for multi media systems, plumbing and drainage. We needed the design of ergonomic surgeries that would work with the existing building structure but most of all work well for our dentists. We found few suppliers actually provide full installation services or consultancy on how the surgery can be designed to the maximum benefit of patients and dentists. We found that the builders, suppliers and the engineers had little or no understanding of the dentists’ needs - each worked according to their own agenda. As dentists we needed the work to be carried out competently, efficiently and quickly so that we could get on with providing our patients with high level dental expertise. Our dentists did not want to have to worry about plumbing and electrical details. We ideally needed a one stop shop to take away all the hassle. We source all our equipment from one dedicated, high quality manufacturer - no delays, no quality assurance issues. No expensive middle men resulting in lower costs all round. Expertise provided by engineers and dentists – as practitioners we understand your needs - combined to bring you the best in the supply of dental equipment and installation, surgery design, modification, and build. Great, reliable and committed customer service – prompt quotes, careful design, efficient installation, left clean and tidy and great after sales support. In essence we treat you in the way we want to be treated. A seamless service, taking away the hassle and the stress, so that you can get on with your job.